Making Progress, so to speak. I've covered a lot of Fighting Illini sporting events since becoming The Illini Guy, but nothing quite compares to this past Saturday, when I traveled to Wrigley Field in Chicago to watch Illinois and Northwestern do battle at the Friendly Confines. This game had historical implications to begin with, but the Big Ten Conference making changes to the way the game was to be played on Thursday made this even more bizarre. Even though the powers that be knew that the east endzone would be an issue with the rightfield wall being right there at the end of it, they decided that in order to promote safety for both teams, they would just move from east to west and bypass that side of the field altogether. Very strange was the consensus when this decision was announced, but in all actuality, it was kind of a neat phenomenon once the game actually started. Yes, it was rather strange watching both teams occupy one side of the field on offense, and say what you will, but it reminds me of the old backyard football games we played as children growing up, having one team walk to the other end when the other team scored. Wrigley Field hasn't hosted a college football games since 1938, and hasn't seen football within its boundaries since the Bears left in the early 7o's. The enhancements of Wrigley over the past few years led to the decision of having the field move east to west. Once the game began, it felt more like a regular college football game. You couldn't really tell that they were only going one direction by the television monitor in front of me. This is actually a cool atmosphere, especially as darkness descended on the field. As for the game itself, it was another track meet from start to finish, with some big plays sprinkled in by both teams. Mikel Leshoure pretty much had his way in the ballgame, setting an Illinois record for rushing yards with 330 on the ground, carrying the ball 33 times and scoring twice. You could tell it was going to be a good day for Leshoure as his first two runs from scrimmage went for 32 and 30 yards, respectively. The old record, 315 yards, set by Robert Holcombe, stood since 1996. More importantly, the win over the Wildcats gave the Illini their elusive sixth win, making them bowl eligible for the first time since the 2007 season when they went to the Rose Bowl. This is quite an accomplishment for Zook and the Illini, since they weren't expected to do this well. Given the changes in all of the coaching positions in the offseason left a lot of uncertainty, the results have been better than expected. The Illini will get a chance to get their 7th win of the season on Friday night when they travel west to Fresno, California to battle Fresno State (9:15 pm, CT, ESPN2), a team that defeated them in overtime last season in Champaign. The Illini can put an exclamation point on what they claim a successful season with a win over the Bulldogs. Then the decision will be handed down on Sunday evening when the bowl pairings are announced. Most likely, the Illini are ticketed for the Texas Bowl in Houston, but anything is possible at this point. At least they are headed somewhere and will be practicing in December, something that all teams wish they could do. Bruce Weber's Fighting Illini basketball team finished the 2K Sports Classic benefitting Coaches vs. Cancer with a split in New York City, losing to Texas on Thursday night 90-84 in overtime, then coming back to win Friday evening against Maryland80-76 to capture third place in the tournament. The Illini had chances to beat the Longhorns, but couldn't get the job done, suffering their first defeat of the season. The Illini have certainly been busy since they returned from the Big Apple, hosting a pair of games, and going on the road into a hostile environment. The Illini hosted Yale last Tuesday, and came away with a 73-47 victory in a game that never really was in doubt. Given the late start of the contest, it was still rather well attended. After the win over the Bulldogs, the Illini ventured to Kalamazoo, Michigan to face the Western Michigan Broncos. Why Kalamazoo, you ask? Well, this was part of the football deal with the school, and since the Illini played there in 2008 for football at Ford Field in Detroit and in basketball in Champaign last season, they needed to return the favor, playing up there. The Broncos will return the favor on the football field next season, coming to Champaign to battle the Illini. This was labeled a trap game for many reasons, given the fact that the Illini stumbled in Las Vegas last season against Utah and Bradley, losing both games. The result against Western Michigan was a favorable one, as the Illini defeated the Broncos 78-63 to set up the showdown with North Carolina in the ACC/Big 10 Challenge this past Tuesday night. The Illini and North Carolina have quite a history over the past several years, dating back to the memorable national championship game in 2005, a game in which the Tar Heels won 75-70. The teams have met seven times before this game, with the Tar Heels holding a slight 4-3 advantage. On this night, the Illini would prevail 79-67, as they placed 5 players in double figures, led by Mike Davis with 20 points. Demetri McCamey scored 17, while Mike Tisdale added 14. Jereme Richmond and D. J. Richardson scored 12 and 11 points, respectively for the Illini, who improved their season record to 7-1 on the season. The Illini have another tough test awaiting them this coming weekend, when they travel west to Seattle, Washington to battle the Gonzaga Bulldogs at Key Arena (4:00 pm, CT, ESPN). The Illini have a score to settle with the Zags, as they defeated the Illini in the annual United Center game in Chicago last season. However, this one will be tougher, since it is on a neutral court and a long way from Champaign. But, there will more than likely be more Illini fans in Seattle for this game than there were Gonzaga fans in Chicago last season, given the fact that there are Illinois alums scattered all across the country, and a good contingent in the Upper Northwest. Good news for the Big Ten for the second year in a row, as they won the ACC/Big Ten Challenge by the slimmest of margins, 6-5. Winners for the Big Ten included Illinois, Purdue, Ohio State, Michigan, Wisconsin and Northwestern. Given the fact that the ACC won the first 10 challenges between the two conferences, it was a good feeling to see the Big 10 come out on top, although they have some work to do in order of evening up the series. Something that remains a question is the play of Jolette Law's women's team. The Lady Illini just returned from a trip to Hawaii, where they went 1-2. The Illini started off last week with a rare 11:00 am game on Monday at home against Cal Poly, a game in which they won handily 104-63. The uniqueness of the unusual start was that a lot of students from area schools attended the game, which made the Assembly Hall seem more populated than it normally would at that time of the day. In Hawaii, the Illini defeated Long Beach State 69-48, but lost to North Carolina 87-58 and Ole Miss 70-61. Wednesday night was the womens' turn for the spotlight, as they hosted North Carolina State in the ACC/Big Ten Challenge. The game was on the Big Ten Network, and from the looks of it on television, there wasn't very many in attendance. It is almost embarrassing to see the Illini women on TV, and see a near-empty Assembly Hall, especially when other venues that host womens' games have much larger crowds attend. I guess that winning games will help the attendance, but for this crop of players, I just don't see that as an option at this time. The Illini head to Boulder, Colorado this weekend to battle the Buffaloes in the Big 10/Big 12 shootout. Finally, despite losing 3 of their last 4 matches of the regular season, Kevin Hambly's Illini volleyball squad will host in the first and second rounds of the NCAA Tournament, which starts on Friday at Huff Hall. The Illini dropped matches on the road to Indiana and Purdue without their star Laura DeBruler, who was lost several weeks ago with a torn ACL. The Illini finished the regular season at 22-8, and will take on Austin Peay Friday evening at 7:00 pm. The winner of that match will face the winner of the Cincinnati-Western Kentucky match, which precedes it, for the right to move on to the next round. I really don't know where to begin here, so I'll start with the obvious; the Fighting Illini football team may have been pretenders all along. All this talk of a possible b*** has severely gotten into their heads, and as a result, dropped a game they had very much in the palm of their hand to lowly Minnesota. That's right, the 1-9 Golden Gophers. Well, make that the 2-9 Gophers now, since they beat Illinois 38-34 last Saturday at Memorial Stadium. The Illini had a 10 point lead in the fourth quarter, but couldn't seal the deal and let Minnesota score two touchdowns late to seal the victory. Taboo was talk of the b***, and even though the players were acting like they weren't thinking about it, they are kids and you know darn well they were. But, I have to think that a good portion of this loss must fall on Coach Ron Zook, who has about as good of clock management skills that I do, and that is not a compliment. It seems as if Zook has taken control of the offensive and defensive play calling in the last two weeks, because the Illini have fallen back into the same frame of mind that they had last season when they went 3-9. Now, they must win one game to qualify for that elusive b*** eligibility, and with Northwestern and Fresno State, both road games, looming on the schedule, that is a tall order. The Illini head north to Chicago this weekend to face the Wildcats, but the venue will not be Ryan Field in Evanston (2:30 pm central time, ESPNU). Instead, the Illini and Northwestern are playing at historic Wrigley Field, who has not hosted a football game in over 70 years, and has not seen football of any kind since the Bears played there in the 70's. The unique atmosphere has its share of concerns though, as one of the endzones borders the outfield wall, a sure sign of disaster if someone runs a long route pattern and forgets where they are. Deemed the Wrigleyville Classic, the Friendly Confines has been transformed into Wildcat purple, including the historic marquee outside the stadium, which also took on a fresh coat of purple paint, one that would make Barney proud. ESPN Gameday will also be there broadcasting throughout the day, but the funny thing about that is the game is not on one of the major channels of the network, instead being slotted to "the U", only available to about half the regular subscribers. I wonder what will happen if Lee Corso picks Illinois to win the game, because he normally chooses a headpiece of the team that gets his vote. Doing a chief headdress would certainly fuel some debate, but we'll just have to wait and see. The Wildcats are 7-3 on the season and come into the game ranked #25 in the country, but lost their starting quarterback Dan Persa on the last play of scrimmage last weekend when they upset the Iowa Hawkeyes in Evanston. Evan Watkins gets the start this week, and he has only attempted 7 passes in his collegiate career. But, with the Illini secondary performing like they have over the past couple of games, does it really matter who the Wildcats throw under center? This would not be a good scenario to rely on the game in Fresno, California in 2 weeks as the last chance to gain b*** eligibility. Stay tuned on this one. Now for some better news. Bruce Weber takes his #13 ranked Fighting Illini east to Madison Square Garden in New York City this weekend for the culmination of the 2K Sports Classic benefitting Coaches vs. Cancer. The Illini will take on the Texas Longhorns Thursday night (approx. 8:30 pm central time, ESPN2), then, pending the outcome of that game, will take on either Pittsburgh or Maryland on Friday night. This will be a good early season test for the Illini, and should give a good indication of how talented this team is. The Illini need a good showing in the Big Apple to keep those lofty expectations in tact. Games against North Carolina and Gonzaga loom further down on the schedule before the rigorous Big Ten season begins just prior to the new year. The Illini are 3-0 on the young season, and are coming off an 85-63 win over Weber's former school, the Salukis of Southern Illinois. Weber brought the Saluki program to prominence before moving north to Champaign, and below I-64 he is still considered a figure of authority. The Longhorns are 2-0 on the young season, and are ranked #22 in this week's poll. Wrigley in November? Should be mighty cold on those rooftops! Should be interesting. That's all for this week. Happy Thanksgiving to everyone. If you are a sports fan like myself, then you have to love this time of year, as sports seasons begin to overlap. It seems that there is something going on every single day, which keeps people like me constantly on the go, making it happen and reporting it to everyone out in cyberspace. So, here goes for this week. By now, you know that the Illini and Michigan hooked up on the football field last Saturday, and a track meet of epic proportions ensued, with the Wolverines ending up on top 67-65 in 3 overtimes. Yes, it more resembled a basketball score, but it was, in fact, football. I knew that the Michigan defense wasn't very good, and that their offense could put up points in bunches, but I did not expect to see triple digits in points, and over 1200 yards in total offense. The Illini defense, who has been very good for the most part this season, took the afternoon off, as they let Denard Robinson, and then, Tate Forcier, have their way with the secondary. Wolverine wideout Roy Roundtree caught 9 passes for an astonishing 246 yards and scored twice, including a 75 yard pass from Robinson on the game's first play. That should have been the first indicator that this was going to be a shootout. Illinois quarterback Nathan Scheelhaase keeps getting better and better each week, and his numbers in this game weren't bad at all. Scheelhaase completed 14 of 25 passes for 211 yards and 3 scores, two of them going to Mikel Leshoure. On the day, Leshoure had 5 touchdowns total, to go with 123 yards rushing and 52 yards receiving. Scheelhaase once again was honored as the freshman of the week in the Big Ten, his fifth so honor this season. Leshoure also was named the offensive player of the week in the conference for his efforts in the loss to the Wolverines. Believe it or not, this team is getting better, and still remain on the cusp of bowl eligibility, which they can take care of this Saturday when 1-9 Minnesota visits Memorial Stadium (11:00 am, Big Ten Network). This will be Senior Day for a host of Illini, including occasional quarterback Eddie McGee, who will be among the players taking the field at Memorial Stadium for the final time. Once bowl eligibility is achieved, then they can concentrate on the final two games of the season and improving the bowl that they will more than likely be going to. Illini basketball is in full swing, and now that the exhibition games are over, it is time for them to count in the regular season standings. This is the earliest start in the history of the Illinois program, and they are currently in the middle of the 2K Sports Classic benefitting Coaches vs. Cancer. Coach Bruce Weber is a strong advocate of the battle against cancer, so it is fitting that the Illini were asked to play in this year's classic. The Illini opened up at home against UC-Irvine on Monday night, and used a strong first half to defeat the Anteaters 79-65. Brandon Paul led the way for the Illini with 18 points, while Demetri McCamey and Mike Tisdale scored 13 and 12 points, respectively. This was the first game in the 2K Sports Classic, and on Wednesday night, the Illini played the second game against Toledo, which ended up being a slaughter. Toledo was pretty much gutted in the off-season, and a new coach and several new players spelled disaster from the get-go. The Illini jumped on the Rockets early and often, and built up a 25-5 lead before Toledo knew what hit them. Behind 13 points by McCamey, the Illini were able to rest their starters and get some other players some much needed minutes. That is, all but Crandall Head, who did not play because according to Weber, "he didn't take care of his business". We have come to know over the past few seasons that this means either he didn't attend a class or some other disciplinary measures. It was a landslide from the start, and it ended 84-45 in favor of the Illini. The Illini showed flashes of the talent that they have, but the road just gets tougher from this point forward. A game that Weber did not want to play will take place on Saturday night, when Southern Illinois comes to the Assembly Hall (7:00 pm, Big Ten Network). According to Weber, the game was agreed upon by assistants from both schools at last year's Final Four. Chris Lowery, who coaches the Salukis, was a former player of Weber's and a former assistant at Illinois under Weber. So, you can see why he doesn't get a thrill from playing this game. From there, the Illini will head to the Big Apple for the conclusion of the Coaches vs. Cancer event when they take on the Texas Longhorns next Thursday. This will be the first true test of what this team has, and we should get a good idea of how good they really are after these two games at Madison Square Garden. Wednesday was National Letter of Intent signing day, and in what is becoming a trend with Weber lately, has been getting some good, quality recruits to come to Illinois. This year is no exception, as 4 four-star athletes signed on the dotted line to play for Weber. What is more remarkable about this is that they are all from the Chicago area, and with the last 2 classes beginning to make an impact, the idea of stacking classes gives fans in Illini Nation reason to have hope. Tracy Abrams, a guard from Chicago Mt. Carmel, headlines the class, followed by Nnanna Egwu from St. Ignatius Prep. 6'6 wing Mychael Henry hails from Orr High School, and was a later bloomer that attracted Weber's attention last season, and the last recruit to make it official was Michael Shaw, who is from DeLasalle Institute. All of these players should add to the current squad quite nicely, and will attempt to fill the void when the Illini lose McCamey, Tisdale, Davis and Bill Cole next season. Does the question still rage that Bruce Weber cannot recruit? I'll let you be the judge of that one. Illini women's coach Jolette Law also signed a good recruiting class, headlined by Ivory Crawford of Proviso East High School. Two more players from the state of Illinois will play next season for Law, those being Kierra Morris of Morgan Park Academy and Taylor Tuck of Bolingbrook HS. Law also snagged two players from the state of New York in Nia Oden (Christ the King HS, Brooklyn) and Alexis Smith (St. John the Baptist HS, West Islip). This class, combined with what is currently at Illinois, should give them some added depth. As has been the case over the past several years with the women's program, there are some issues with one of the players. Adrienne GodBold has been suspended 6 games for a violation of team rules, while Kersten Magrum will miss some time as well due to an injury. Those absences didn't seem to stop the Illini in their lone exhibition win, a 100-37 triumph over Division II foe Kentucky Wesleyan on Tuesday night at the Assembly Hall. Karisma Penn led 7 Illini players in double figures with 18 points, and recorded a double-double with 11 rebounds. Junior Lana Rukavina also had a double-double, scoring 17 points and carroming 10 boards. The Illini open the regular season on Friday evening when they host the Illinois State Redbirds at the Assembly Hall. Finally, Illini women's volleyball is still very much in the driver's seat for the Big Ten title, and this weekend's matches at Ohio State and Penn State could go a long way in making that claim a reality. Coach Kevin Hambly also signed some good recruits for next season, inking four new players. They are as follows: Jocelynn Birks (Lyons Township HS), outside hitter Morgan Criswell (Decatur LSA), 6'6 blocker/right side hitter Liz McMahon (West Liberty Twp, Lakota West HS in Ohio), and Ali Stark (Mt. Vernon, Iowa). These four recruits, in addition to what Hambly already has, should keep the Illini in contention for the forseeable future. See, not too much going on, is there? That's it for this week. Get Your Bowling Shoes On? They say defense wins championships. They may be on to something. The Fighting Illini football team inched one step closer to becoming bowl eligible by defeating Purdue rather handily last Saturday at Memorial Stadium 44-10, but the most intriguing part of the whole game was the attendance. Where in the world was everybody? Granted, the Illini have not had the level of success that, say, Michigan or Ohio State have had over the past decade, but to give Ron Zook and his team the benefit of the doubt, this is a team that is now 5-3 on the season and knocking on the door of bowl eligibility. They have made significant strides during the season, and that can be attributed in large part to the work of the defense under new coordinator Vic Koenning. I have heaped praise for Koenning before in this blog, and I will continue to do so until he gives me reason not to. 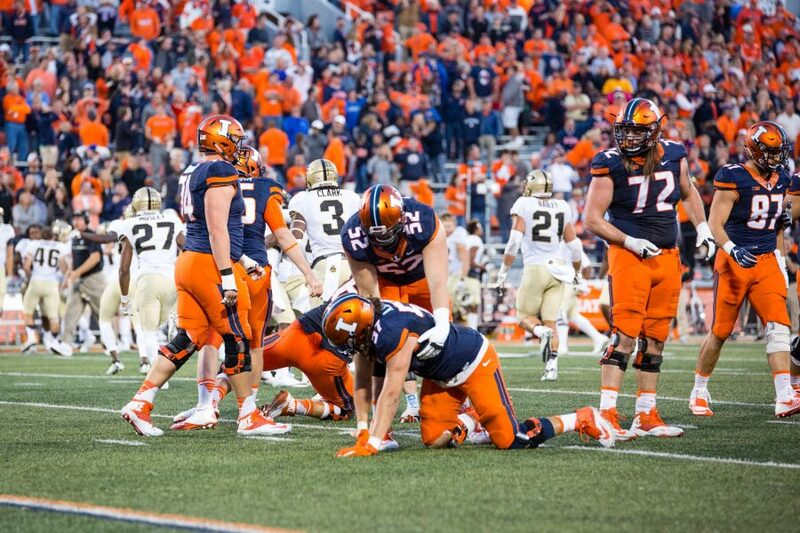 The Illini defense has risen to the occasion more often than not in 2010, and while the offense has sputtered in several games, it has been the defense that has sustained much of the momentum and spurred the Illini on to victory in those games. In the win against the Boilermakers, the offense finally showed signs of life, as quarterback Nathan Scheelhaase completed 16 of 20 passes for 195 yards and threw 4 touchdown passes, all to different receivers. Among the recipients of the touchdown grabs were freshman Darius Millines, who caught his first collegiate touchdown, and A. J. Jenkins, who caught his fourth of the season. Mikel Leshoure, who was held to just 23 yards rushing on 15 carries, did manage to get in the endzone 3 times, twice via the run and once on a pass from Scheelhaase. But, before I get too far off on the tangent of my rant, back to the crowd. Folks, this is a pretty decent football team that comes out week to week, but you wouldn't know it by the size of the crowd at most home games. Maybe fans are still reluctant to come out and spend money to see this team in action, or it could be other factors as well. With high school football entrenched in their playoffs now, that probably kept some people away that might normally would have attended. But, the student section in the north end zone wasn't even full, which tells me one of two things: either the students don't want to support their peers, or they would just as soon watch from a local watering hole, apartment or dorm. The bottom line here is there is just one home game left, and by that time, the Illini could be either looking at becoming bowl eligible, or already there, primed to improving their bowl game options. The next step in the process is a tall order, as the Illini head to Ann Arbor, Michigan to take on the Michigan Wolverines at the "Big House". (11:00 AM Central Time, ESPN). Michigan Stadium seats 113,000, and you can bet it will be a full house waiting to greet the Illini. Michigan themselves have fallen on some hard times in recent years, but at 5-3 overall and 1-3 in the Big Ten, they will have a packed house. I just wish I could say the same for the fans here at Illinois. But, I digress. Winning on a consistent basis will ultimately bring the fans back, so until that occurs, I guess we should expect near capacity crowds cheering this team on to victory. Bruce Weber and his Fighting Illini basketball team began their season this past week with two exhibition games, marking the earliest that an Illini team has hit the court to begin a season. The opponents, both Division II foes, and from the Great Lakes Valley Conference, no less, proved to be more of a challenge for the Illini than they ever dreamed possible. The first game, against Lewis University, was tight the entire contest, and a late surge by the Illini finally allowed them to prevail 75-65. A lot can be said for these exhibition games, because as I stated last week, it means more to the team coming in to play Illinois than it does for the Illini themselves. As Weber said, "they have designed plays to work against us, and we are just concerned about getting bodies in and out". The same held true for the second opponent, Southern Indiana, as they came in an stayed close with the Illini for the majority of the game, before falling 76-67. Screaming Eagles coach Rodney Watson, who was an assistant under Weber when he was at Southern Illinois, knows Weber's style pretty well, and even ran some plays that Weber developed while in Carbondale. There is some cause for concern, given the high expectations of this team before the season, but they are just that, expectations. You have to realize that this is a team that missed the NCAA Tournament last season, and are ranked #13 in the pre-season poll without even playing a game that counts. Senior Demetri McCamey was virtually non-existent against Southern Indiana, going 0-6 from the field and only scoring 3 points on the night. Weber says that things are not going the way they intended them to right now, but the next couple of weeks will determine how far this team has come. They take the court 3 times next week, beginning play in the 2K Sports Classic benefitting Coaches vs. Cancer. The first two games of this classic will be at the Assembly Hall, with the Illini taking on UC Irvine on Monday, followed by Toledo on Wednesday. The Illini welcome Weber's former school, Southern Illinois next Saturday evening, then will head towards the Big Apple the following weekend to play Texas, then either Pittsburgh or Maryland. Hopefully the Illini can get their act together before then. The Fighting Illini volleyball team continues to roll right along through the season, as they went 3-0 this past week and maintained their stranglehold on the top spot in the conference. Wins over Michigan, Michigan State and Wisconsin have propelled the Illini to a 20-3 overall record and 12-1 in league play. Even though they have a 2 match lead in the conference standings, they must go on the road for 5 of their last 7 matches and will do so without the services of their leader, Laura DeBruler, who is lost for the season with an ACL injury. However, other players such as Johannah Bangert, Jennifer Bonilla and Michelle Bartsch have filled in nicely during DeBruler's absence, and will do everything they possibly can to keep the Illini in the top spot. The Illini travel to Northwestern on Friday evening for their only contest of the weekend. That's all I got for this week. Stay warm!